| All Day 8 a.m. - 2 a.m.
| All Day 8 a.m. - 3 a.m. Does this restaurant do anything special for birthdays? Yes, Margaritaville offers a complimentary birthday sundae. jumbo lump blue crab meat, gulf shrimp and mushrooms simmered in a Cajun cream sauce and served with toasted garlic bread. Chicken or beef with cheese and roasted peppers, on a chipotle tortilla. Served with fire roasted tomato salsa, sour cream and guacamole. wings tossed in habañero-honey wing sauce with cucumber sticks and mango ranch dipping sauce. Wings tossed with sweet and spicy chili sauce served with veggie sticks and sweet chili dipping sauce. Fried wontons topped with spicy seared Ahi tuna, daikon, Asian aioli, seaweed salad, soy glaze and chili oil. Topped with chili, cheese, guacamole, sour cream, jalapeños, tomato and scallions (you can add grilled chicken or fajita beef for $15.99). Tender shrimp simmered in beer with lemon and Old Bay Seasoning, with our own Key West cocktail sauce and lemon. Buffalo style with veggie sticks and blue cheese. Romaine tossed with Caesar dressing, dusted with Parmesan cheese and our signature sourdough crumbles, topped with chilled grilled chicken (or you can substitute shrimp for $16.99). Mixed greens topped with chicken, bacon, hard-boiled eggs, tomatoes, blue cheese and avocado. Served with your choice of dressing. Substitute grilled shrimp for $16.99. Crisp tortilla shell filled with mixed greens, black bean and corn salsa, mixed cheese, guacamole, sour cream and fire roasted tomato salsa topped with our own taco meat blend. Snow peas, carrots, mixed peppers and mixed greens tossed with sesame-soy-peanut dressing. Topped with fried wontons, sesame seeds and peanuts. With chicken for $13.99, or with grilled shrimp for $16.99. Our signature marinated chicken breast, fajita steak or grilled portabella mushroom sautéed with peppers and onions, served with warm flour tortillas, homemade guacamole, fire roasted tomato salsa, sour cream and mixed cheeses. Chicken for $16.99, Steak or Combo for $17.99, or Mushroom for $16.99. Our house sirloin with our own teriyaki marinade grilled to order. Brushed with teriyaki glaze and served with grilled pineapple, fresh vegetables and mashed potatoes. 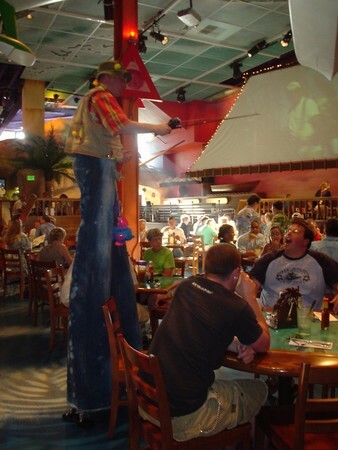 Our friends at Margaritaville® Jamaica showed us this one. Semi-bonless half chicken marinated in authentic Jerk spices and roasted Island style. Served with fresh vegetables and Island rice. Topped with honey-jalapeño-ginger sauce and served with Island rice and fresh vegetables. Ask your server about our selections. Grilled, blackened or pan-fried with fresh vegetables, Island rice and your choice of pineapple-mango salsa, Jerk BBQ sauce or Island butter. Grilled mahi-mahi served with Island rice and fresh vegetables. 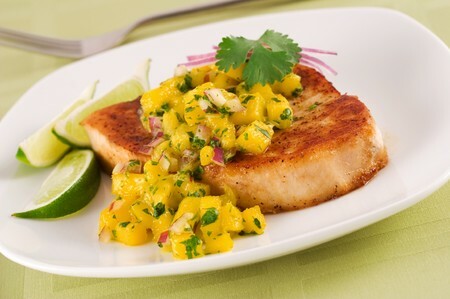 Topped with pineapple-mango salsa. Jumbo shrimp breaded with coconut and fried. Served with orange marmalade horseradish, mashed potatoes and fresh vegetables. Salmon rubbed with our signature Jerk spices and seared in a skillet, finished with Jerk BBQ sauce and a side of mango chutney. Served with Island rice and fresh vegetables. Bell peppers, red onion and ground andouille sautéed with jumbo shrimp (or substitute chicken for $16.99), tossed with penne in a spicy Cajun cream sauce. The Heinz 57 is on the table and don’t forget the draft beer… if you’re old enough. Topped with American cheese, iceberg lettuce, and tomato. Topped with grilled sweet onions, teriyaki glaze and pineapple-mango salsa. Topped with sautéed mushrooms, provolone cheese and tomato relish. An organic vegan patty served with lettuce and tomato. Double the meat on any of our burgers. Roasted pork and sliced ham pressed in a crusty Cuban loaf with mustard, Swiss cheese and sliced pickles. Fresh fish of the day grilled, blackened or fried and served on a toasted bun with tartar and lemon. Roast turkey piled high on toasted Pullman bread with Swiss cheese, lettuce, tomato, bacon and mayonnaise. Pulled pork with guava BBQ sauce and topped with onion rings. Served on thick garlic French bread with a side of cole slaw. Two soft flour tortillas with pan-seared or blackened Mahi Mahi, shredded lettuce and cilantro sour cream. Garnished with cheese, guacamole, salsa and lime. Served with Island rice and tortilla chips. Grilled fajita chicken on a honey wheat roll with Monterey Jack cheese, watercress-avocado mayonnaise, lettuce and tomato. Marinated portabella mushroom, grilled to order and topped with blue cheese, greens, roasted red pepper and beefsteak tomato. Served on a ciabatta roll with Cajun remoulade. 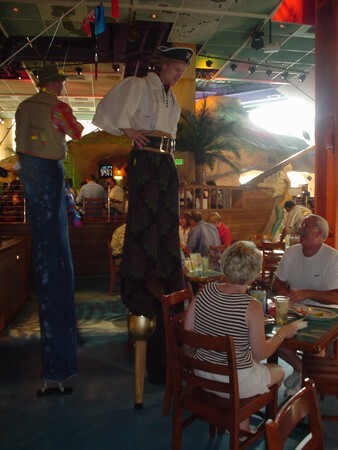 Margaritaville is my favorite bar in Las Vegas. The Perfect Margaritas cannot be beat and the burgers and appetizers make it a great experience. A little noisy in the late night, but still a great place to hang out.